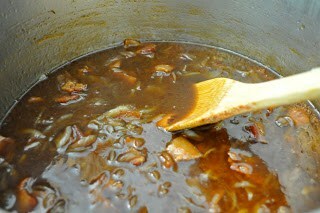 My friend Stephanie invited me over last week to make bacon jam. I’d been avoiding jumping on the bacon jam wagon for a long time because I’m a rebel like that. I finally caved because I really wanted to be around another adult person during the day time hours, small chatty children have a tendency to do that to you. Off we went to make nirvana in a pot. My first job was to slice 5 onions in the food processor while Steph chopped bacon. 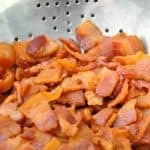 I fried bacon and taste tested next, I’m good at that job! Out came the bacon in went the onions and sugar to caramelize, this is about the point I realized how deliciously evil it was going to be. On and on went the torturous smells of caramelized onions, bacon and whiskey, until finally it was time to puree and taste. Some of it actually made it into jars, to be brought home, although honestly I could have eaten it all, or made an honest attempt to. 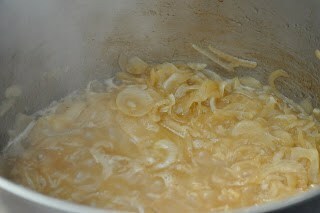 The recipe was departed from so many times I don’t know exactly how much went in to the pot during seasoning time. I’ll give you the basic measurements of the important things and a list of pinches and tads. fresh grated nutmeg about 1/4 of one? 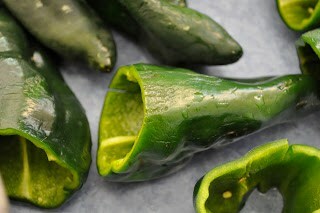 That night Stephanie made big stuffed chile peppers with fresh cheese and bacon jam inside and fried up chile relleno style. I won’t even tell you about the cheese and bacon jam sauce she pour over the top of them, whoops I just did. The next day we had toast and bacon jam for lunch. 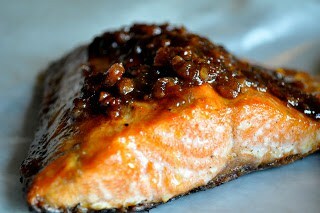 And salmon glazed with bacon jam for dinner. The next day we tried grilled cheese and bacon jam for lunch and then the jar ran out. I’m a wee bit afraid of opening the next jar, I may just sit down and eat it with a spoon. You can easily adjust the spices and flavors to your liking, I think the one thing that really set it off was the nutmeg so don’t leave it out. You could definitely add some ginger to the mix, that would be fantastic. The original recipe called for chipotle powder which we didn’t have, the adults all thought the jam needed a bit more heat and smoke so I will definitely be adding that next time we make this. Sounds like a very fun afternoon. Just made this recipe, used molasses instead of maple syrup. Lots of smoky flavor with that!